From work events to that special day, we have the experience and space for groups from 30 to 200. With 188 exquisite guestrooms, we offer all you expect from a high-end resort and the staff you need for an unforgettable event. 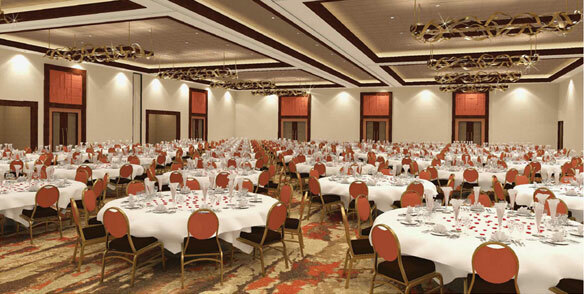 In Spring 2019, an additional new 16,000-square-foot meeting and convention center / ballroom will be introduced as a multi-functional state-of-the-art venue for banquets, private and corporate events, weddings and entertainment. The space (totaling 20,000 square feet) will accommodate seated dinners up to 750 guests, and hold 1,200 attendees for events and concerts. The property’s amenities further enhance the resort as an events and wedding destination with a full-service spa, celebrity chef restaurants, 18-hole golf course, indoor and outdoor pool, casino and nightclub. Packages are available for elopements, groups and parties. When it comes to food and beverage, Mount Airy Casino Resort promises only the very best. Our Executive Chef will guarantee that your functions are flawless, from a simple continental breakfast to a formal banquet. Thank you for your interest. Please fill out the form or call 1-570-243-5125 and one of our representatives will contact you as soon as possible. We specialize in providing all you need to make your wedding dreams come true. Whether you’re planning an intimate affair or a grand gala. Our Wedding Services Specialists are here to help create the matrimony experience you’ve been dreaming of. Having your wedding here means you can enjoy beforehand beauty and relaxation treatments at our Spa & Salon. You can hold an exquisitely beautiful ceremony right on our sprawling property. And enjoy an absolutely delicious catered reception, compliments of our chef. Our banquet rooms, restaurants, nightclubs, luxury hotel rooms, dedicated staff and culinary expertise will create a party atmosphere you’d be hard pressed to find anywhere else. Mount Airy weddings aren’t just for newlyweds. Why not renew your vows? The wedding of your dreams is just a phone call away. For questions, or to schedule a consultation, please contact our wedding coordinator. Happily ever after is just a phone call away at 570.243.5125.